Poor, poor Azrael. He broke a few ribs with that one. Heh. Either way. *hugs Azrael* It’ll be okay man! Oh – And Keep Voting! Today’s the Last day for Round 2!!! Wow. That HAD to hurt. I almost actually feel sorry for Azrael. Though if he’d listened to Grace, for once it would have been a positive thing. OH HOLY FLAMING EXPLETIVES BATMAN! Th-this is terrible! The orb of Bliss is cancelling out any supernatural abilities! 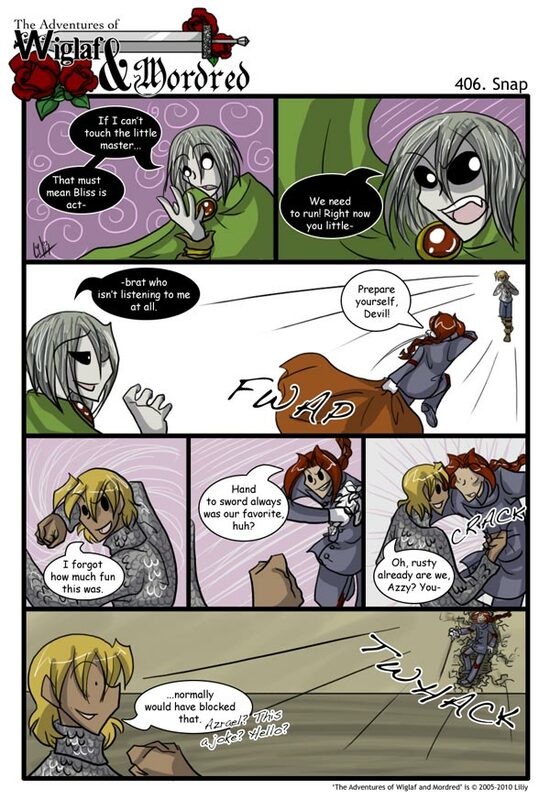 Unfortunately for Azrael, Wiglaf’s abilities are all natural. huh… Grace doesn’t seem to be connected to the sword anymore… very interesting. Poor Azreal…I mean, he’s psycho, but likable. Affably evil? *Snerk* Poor Azzy. He never knew what hit him… Well I guess he did, but still :D Wiglaf looks oh so confused. Grace kinda looks like an owl in the second panel. Owwwww. Glorious. By the way, “little master” has got to be the cutest term a creepy talking sword has ever uttered. How many “creepy talking swords” have you come across?? Poor Azzy, I do hope he figures out what happens so that he doesn’t keep running straight into Wiglaf’s freight train of a fist. You can tell a hero from an anti-hero or even a villain by one key sign: a true hero will show concern over his or her enemies, while one with no heart will show only scorn or apathy. Yes, Wiglaf, being perfect may be your shtick and being a hero only an affection… but by your concern here, you show that being a hero? is something that goes to the very core of your being. Good point, Rob. Wiglaf’s attitude does distinguish his character as a hero as opposed to an anti-hero. A hero generally will not be any rougher than necessary with enemies. Is it just me or is Azrael smoking in panel 7?